Many editors are intimidated by masks. But, really, all a mask does is allow us to select a portion of an image. In this session, Larry Jordan illustrates a variety of practical ways we can use masks to create visual effects and improve our color correction. The masks inside Adobe Premiere are both powerful and flexible, especially when it comes to color correction. Color correction allows us to fix color problems with our clips. With the recent addition of the Lumetri Color Panel to Adobe Premiere Pro CC, Adobe has gathered all of Premiere’s color correction features into one easy-to-access place; while masks allows us to specifically focus where a color change occurs. If you always wanted to learn more about masks, how they can expand the visual effects you create and improve your color grading, this session is for you. This is an intermediate-level session. 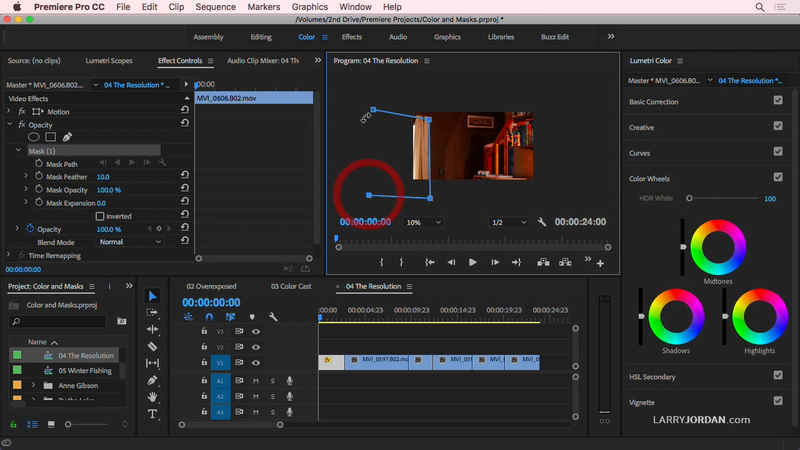 Some knowledge of Adobe Premiere Pro CC will be helpful. No specific knowledge of color or masks is necessary. This session is delivered as a QuickTime movie, so you don’t need to own the software to watch this.